NILAI, May 23, 2018 – Universiti Sains Islam Malaysia (USIM) made another step forward in turning its campus a digital campus when it launched the Cashless Campus Project on Tuesday (May 22, 2018). This Cashless Campus Project is among the initiatives under the USIM Smart Digital Campus Project. This Cashless Campus Initiative is implemented in collaboration with USIM and the industry. For the industry, it is co-operation with Celcom-AXIATA and Boost while at the university level, it is co-led by Center for Global Open Learning, Immersive Technology and Quality Assurance (GOAL-ITQAN), Treasury Department, Islamic Center and USIM Wakaf and Zakat Center. The government has previously set targets that all public universities throughout the country by June 2018, are transformed into smart campuses or fully digital campuses. Through these steps, all campuses will utilize quick response code technology or QR Code for all administrative and access to university’s facilities. The Implementation of the Cashless Campus not only facilitate students as they do not need to rush to ATM machines for money, but are also in line with the latest technological developments seen as current trends or styles and are more synonymous among the younger generation today. “The implementation of the Cashless Campus project which we are launching today is Phase 1 which focuses primarily on cultural aspects from April to June 2018. After this period, we will enter Phase 2 from July 2018 involving the process of integration with other university payment services such as fines, tuition fees, penalties and many more,” said Professor Dato’ Dr. Musa Ahmad, USIM Vice-Chancellor at the opening of the ceremony. “The use of the Boost or eDompet application is seen as very beneficial for USIM in particular. I foresee it will offer a more enjoyable digital lifestyle by allowing easier purchases, money transfers, value additions and digital souvenirs. 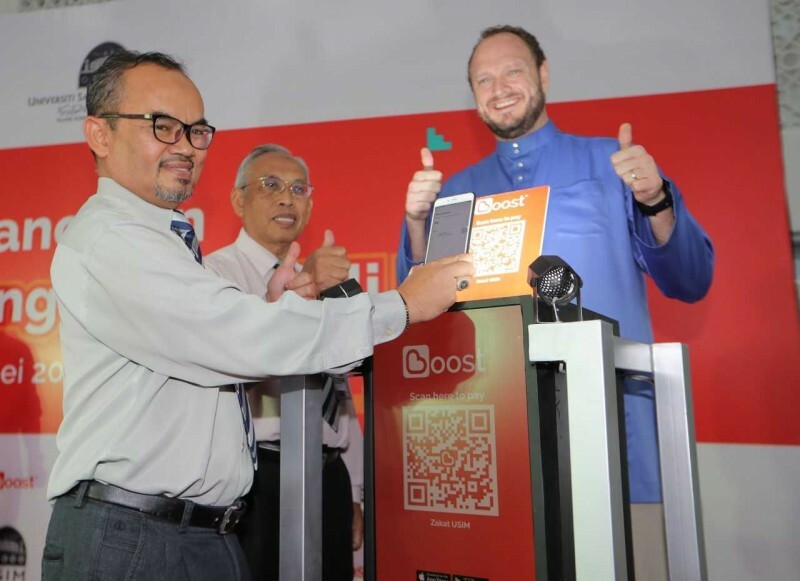 Combining consumer lifestyle needs and state-of-the-art technology, the Boost app offers easier, faster, safer transactions and more extensive experience for USIM campus citizens,” he said. Also launched is the iWAZ Portal developed by GOAL-ITQAN in collaboration with Wakaf and Zakat Center. It is a specific portal developed to make waqf contributions and zakat payments to USIM online. Through this portal it facilitates the prospect of the donors and zakat to ease and quicken transactions. Also present at the ceremony held at the compound of Tuanku Muhriz Islamic Complex of USIM were Mr Chris Tiffin, Chief Executive Officer of Boost; Dato Nohd Abd Rasid Mohd Fadzil, USIM Treasurer; and Professor Dato’ Dr. Hassan Basri Awang Mat Dahan, USIM Deputy Vice-Chancellor (Student Affairs and Alumni).